Gentlemen, I am new. I am a Vietnam Vet, 2 tours, Special Forces, MACV-SOG and have spent some 25 years of the last 50 abroad from the USA. I’m a gun enthusiast but not an expert. About 3 years ago I bought an English hand-made EM Reilly, 12 ga. SxS hammer-gun shotgun after thinking about purchasing an English double for 25 years. The reason? I served at the American Embassy in India for three years in the late 1980’s. My landlord was Indian Army Major General D.K. (Monty) Palit, former chief of operations of the India Army (during the Indo-China War), WWII Indian Army veteran, and noted military author. He was from a highly educated upper-class Indian family (Bengali father - senior doctor in the Indian Army, Mahratta mother) which had adopted British customs when it came to gun-sport. He had 5 doubles on his wall passed down by his father and grandfather, I believe they were: a 12ga Holland & Holland, a 12ga E.M. Reilly, a 16ga possibly Army-Navy, one I’m not sure of and a 20ga. William Evans. 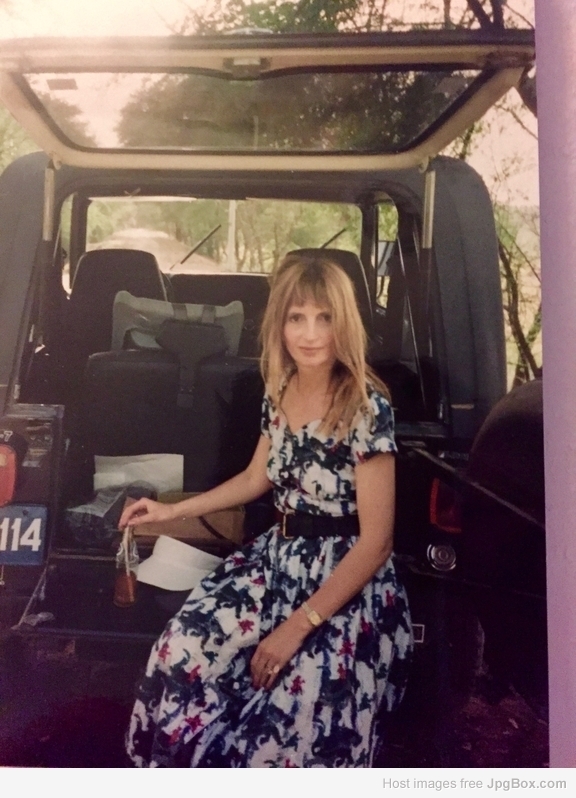 I had a CJ-7 Jeep in New Delhi at that time; he had the hunting permits; and we went out often in the Falls of those three years, hunting ducks, dove and quail in the brilliant yellow mustard fields of Uttar Pradesh on the Gangetic plain. He used his H&H; I used my Remington 870 - a pump - something he informed me one didn’t do in polite society (I countered that in Alabama we might have a dog…here he had 5 shikaris and a couple of servers cleaning the birds and making duck-curry sandwiches…different places, different solutions). But the idea that I needed a SxS became fixed…even more so when he gifted my wife the 20ga William Evans as we left country. Since then I’ve held dozens of English SxS’s. Nothing felt right. Then at a gun show in November 2015 in Northern Virginia a Reilly hammer gun just stuck to my hand. It was 6 lbs 1oz, chambered for 2 1/2; 30” Damascus barrels; twin triggers; no ejectors; with that beautifully slim upper stock and receiver back that comes with hammer guns - It was similar to the General’s E.M. Reilly as I remembered it; Perhaps I had imprinted on that gun? But whatever It felt like a rapier, while everything else now seemed like battle-axes. The seller had about 15 guns from very high-quality makers. He said I was the only person ever to show interest in the Reilly. He insisted on my shooting it..I did and couldn’t part with it..It had some imperfections; it wasn’t pristine, had been worked on; I paid too much but it was my gun. Now here is a request. Reilly exported a lot of guns to the sub-continent. I have found labels with Sanskrit writing on them and have found references to various maharajas who bought them. 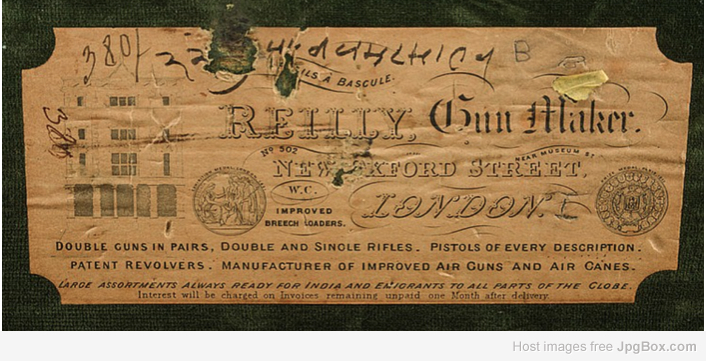 If anyone has a Reilly or knows of Reilly guns in India, I'd much appreciate serial numbers, type, bore, action, and the name and address on the ribs and photos if possible. "Afterward, we were ferried out to the palace of the maharaja of Kolhapur, a late-Victorian pile in the syncretic Indo-Saracenic style invented by the British. It was designed by the English architect Charles Mant, although Lewis Carroll might have had a hand in it. "The maharajas were great collectors of empire's bric-a-brac. The tomblike salons exuded a Dickensian squalor and were crammed with sambar heads and taxidermic elephants in full regalia, horse racing trophies, and stuffed fantail snipes. There were lamps with deer hooves for stands, electrically illuminated peacocks, glasses with boar-tusk handles, and beautiful English guns from the London firm of E. M. Reilly. I wrote a request for information on the Maharaja of Kolhapur's site - never heard back. I will post some guns and labels separately which hopefully someone can answer. By the way during my time in India I had the pleasure of meeting a large number of retired Indian generals and to listen to all sorts of history from them. It was fascinating since I'd done the same thing with their compatriots in Pakistan 10 years previous. As mentioned I've compiled a history of Reilly. It includes dating Serial Numbers, etc. It also includes cataloging original labels. Here are two labels which have some Sanskrit writing on them which I'd much appreciate some help with. The writing might be dates or numbers of some kind. Could anyone who reads Sanskrit please comment. thanks. This is the label used by Reilly from 1855 after the Paris Universelle exposition to autumn 1859 when the name changed to E.M. Reilly & Co. The drawing is the shop, manufacturing facility at 502 New Oxford Street. The medals are the ones for the 1851 "Crystal Palace" international exposition and the 1855 Paris Exposition Universelle. 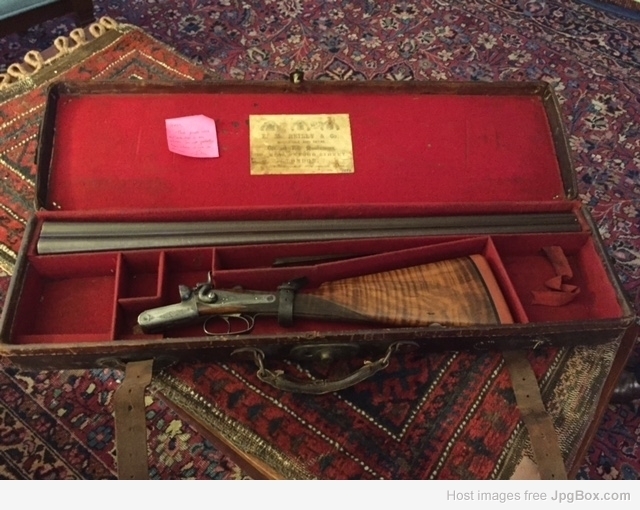 It was in a case for a 4 barrel, 11 bore, muzzle loader, a pretty amazing gun. The problem is the gun has E.M Reilly on the rib so the label and the rib inscription don't quite match up. This label was found in a case for Reilly SN 13599, which would have been numbered in late 1864: - E.M. Reilly & Co., 502 New Oxford Street, London. 12 bore; Rifle SxS; 2 groove Percussion double express Hammer gun, muzzle loader. Fantastic post. You are privileged to have been associated with almost the last of that rare breed of men as far as the sub-continent is concerned. I wish there is some way we could be audience to the stories you could share with us. If you do decide to share the, please know that they will be greatly appreciated here. Re the Sanskrit text, could you please post a higher resolution photograph as an attachment here? There are several here who can decipher that. Vikram, thanks for the come-back. I have many stories of General Palit and his brother-in-law General Krishnan Sibal and some of the other Indian Army generals who were there when India and Pakistan split up the country and divided the armed forces. I also can give some pretty cogent assessments of each; I played golf at the Delhi Golf Club with many of them and believe me the rivalries continued long after their retirements. 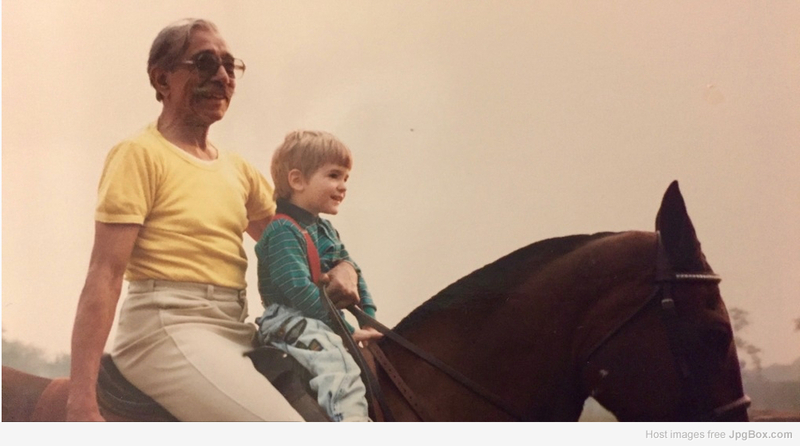 ,,,,,"Christopher, the younger son, then three years old, used to love riding on my pommel as I hit the ball about the 61st Cavalry polo ground; and I soon became his favorite outsider. That's how close we had become to each other. On Sunday's, Patel's day off, Geneviéve even insisted on serving me at table with a cooked breakfast from her kitchen! 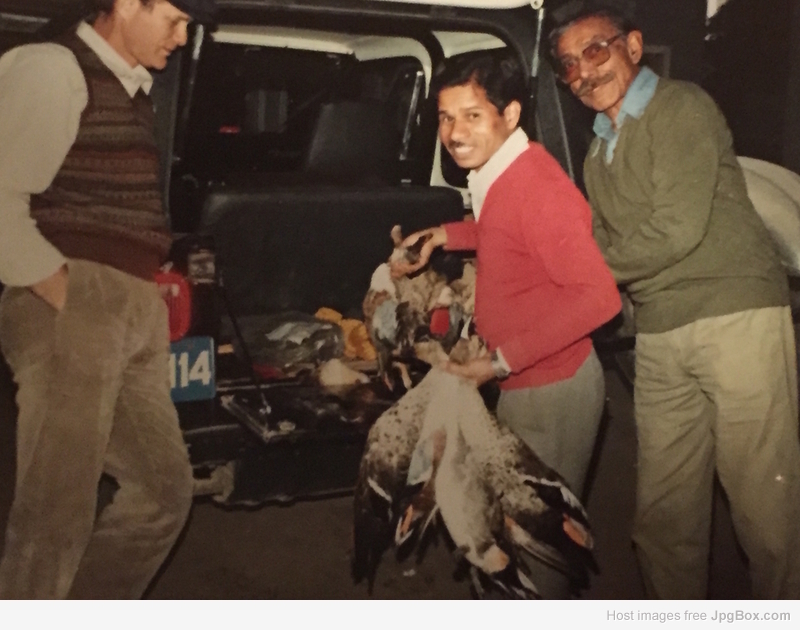 ....."And when Gene began to accompany me on duck and partridge shoots at Aurangpur, it put a firm seal on our closeness. (Gene, as one might have expected, possessed a single-barrel "pump gun" - the hallmark of the average American sportsman! - heavy and cumbersome with its 32" barrel. 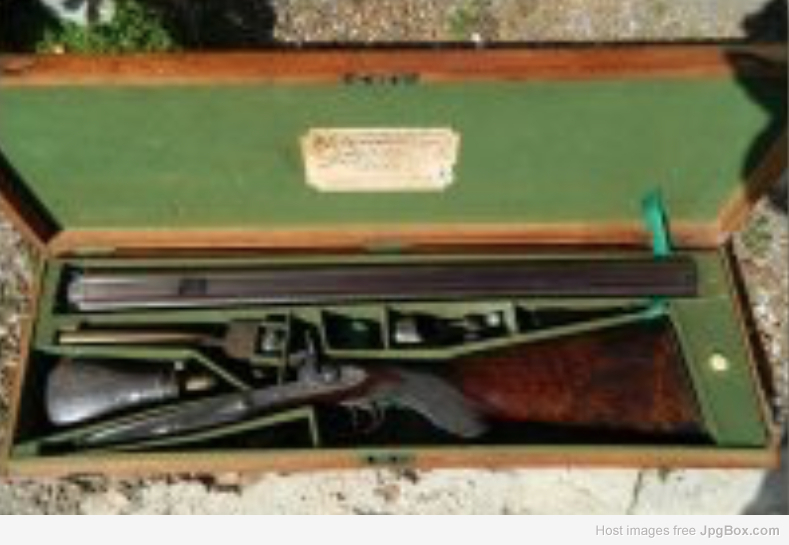 So he began to use my William Evans fully-finished box-lock .20 bore (bequeathed to me by my old friend Reggie Sawhney, when he married his American second wife and migrated to the States). After a three-year stint, when the Williams' were posted back to Washington, I in turn presented the gun to Gene." Uh. excuse me General....I hit everything with that "cumbersome Remington 870." (Oh the Empire - even its remnants - and its pretentions! smile ...) And you gave the Williams Evans to Geneviéve, not me (ok maybe you gave it to me but she claims it, QED). Information the William Evans 20 gauge Gen. Palit gave to my wife can be read here along with pictures of her, and of my then 3 year old riding with the General on his polo pony: Photobucket hijacked the photos for ransom but restored these after awhile. You'll see an assessment of the General and some information on Captain Reginald Sawney who originally have the 20 gauge to Gen. Palit. Vikram, this board apparently limits the size of the photos posted...but they can be expanded...and if you click on them, it will take you to JPGBOX which should have a full photo of the labels. Many thanks for any help. Thanks. I didn't mean to make this about General Palit. I really was looking for information on Reilly's in India. Reilly sold a lot of them; he had an agent in Calcutta (Lyon?) and one in Madras (Oaks & Co.) He won medals at the 1882 British Empire only Calcutta World's Fair. But still would welcome talking about him to those interested. If anyone knows anybody in the circle of the maharaja of Kolhapur, would much appreciate some asking about the Reilly's. 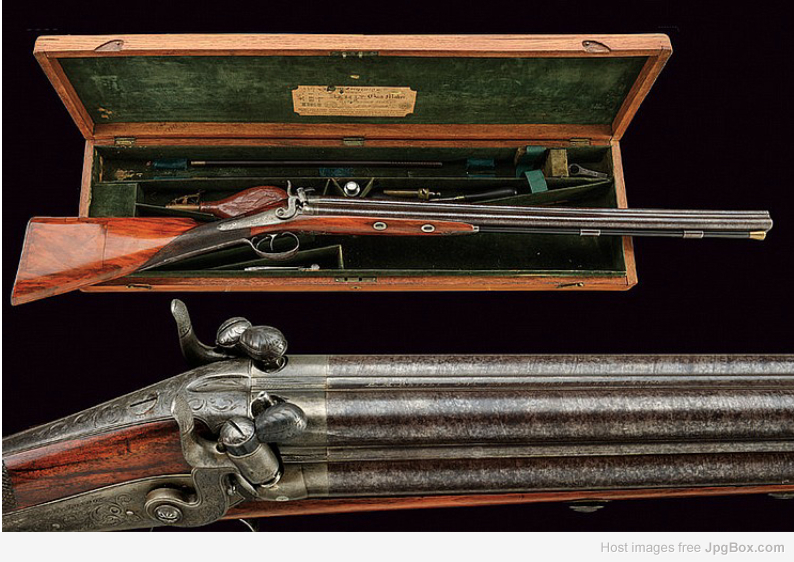 Reilly was actively selling guns to officers going out to India as early as 1830's and there is a dearth of information on extant serial numbers from 1830 to about 1858. Thanks. 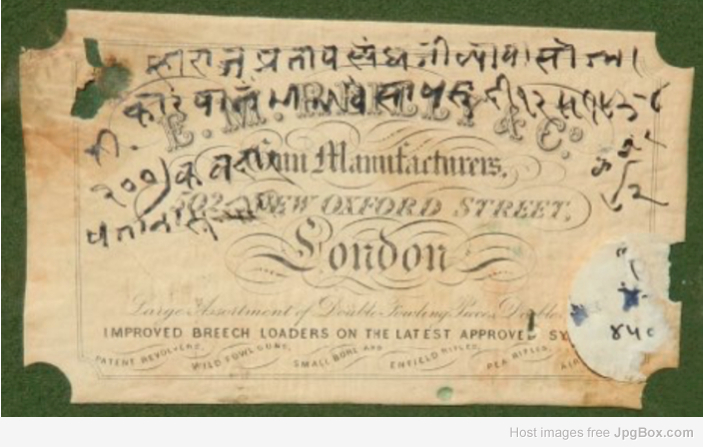 If you can read Sanskrit/Devanagari, please help our member in deciphering the text in this photo. Thank you. Since there is some interest in General D.K. (Monty) Palit, I'll repost something I put on Doublegunshop which summarizes his career. I will say that we saw each other everyday for 3 years; he visited us in Greece and we drove up to Meteora, went past Thermopolae, went to Delphi and down to the Peleponnese to see the ruins of Mycenae. He visited my brother in New Orleans. After this summary, later on I'll add some vignettes never written about hunting in Aurangpur, some hunting protocols he picked up from his Commanding officers and passed on to his subordinates, some observations about the "Permit Raj"...(I had a Black CJ-7 in New Delhi. The only other such Jeep was owned by Rajiv Ghandi. I kept a sign in my Jeep "This is not Rajiv Ghandi's Jeep" and I was there when he was assassinated in May 1991), something about Lt.Gen Krishnan Sibal, etc. And incidentally, I never ever called him "Monty"...he was always "General." And I'll again make a plea that if anyone can locate Vol II of "Musings and Memories," I'll buy it. I've tried e-mail with publishers and local book stores in New Delhi. General Palit was born in 1919. He was a Bengali. (He said his mother was Mahratta but I was never sure of this - India at the time was still very much 19th Century and I had a feeling the connection he claimed to the Mahratta's was his way out of being type-cast as a Bengali). His father and grandfather were medical doctors - they went to British schools and England and adopted English ways especially when it came to gun sports. His father in fact became a very senior medical officer in the Indian Army, was quite well off, and latter remarried a British lady who had been a nanny in the house (I met her - very interesting woman). Gen Palit opted to go into the Army and went to England for awhile about 1937 to study. This was difficult for a Bengali at the time because the Brits had classified the various "races" in India according to war fighting proclivities. Pashtuns, Sikhs, Maharattas, Rajputs were warlike...Bengalis were relegated to medical and food. He had the temper of a bantam rooster though and through intellect and force of will (and guile - yes he was wily) climbed the ranks in the Indian Army, first under the Brits (his first regiment was the 10th Baluch - I have a swagger stick from that regiment) then after 15 Aug 1947 in the Indian Army where he was assigned to the Gurkhas (He was a Colonel of the Gurkha regiment for his entire life). He was a Major General when the Indian army only had 4 major generals and the Chief of Staff was 3 star. His discussion of the Sino-Indian war (1962) was fascinating...(and as every Indian account of that debacle, possibly self-serving). as well as the Pak wars of 1948 and 1967. He was our landlord in India. He had built a large house in Shanti Nikitin neighborhood of New Delhi, not too far from the American Embassy and rented to the Embassy - and lived on the same compound in a small town house attached to the main house. He was not a big man - 5'9", wiry. He was very fit and was still playing polo when I left - he was 72 at that time. He was divorced; his son wasn't much interested in his life (I don't think - although I met and liked him - a very intelligent and handsome man if somewhat lost). When I knew him Gen. Palit was extremely disciplined. He would rise at 0500, do an hour or two of yoga, he would write from 0900-1000. He came over every afternoon about 1800 for one whiskey. He also had tea with my wife regularly and adored our youngest son to whom he gave a polo pony (when the boy was 3 years old). As he got older he became ever more the Indian nationalist and his writings took an anti-colonial, vaguely anti-capitalist West, Indian socialist turn. He claimed to be very Hindu though I don't think he was all that religious. Nevertheless his military writings were deemed important and one of his books was used regularly in the US Command and General Staff College in Birmingham. In fact because I had his ear, as Desert Storm approached I was asked by the Ambassador to discuss the upcoming offensive with him and a number of retired Indian generals, to try to get the Indian government to persuade Saddam to get out of Kuwait. The effort failed of course and India, rather sillily following its socialist/anti-Western colonialist mantra, threw in with Saddam at the last minute - one of 7 countries to do so, Cuba, North Korea, Peoples Democratic Republic of Yemen, Soviet Union, Sudan, etc. Nice company. He had on his wall 5 SxS's. a 12 ga. Holland & Holland; a 12 ga. Army-Navy; a 12 ga. EM Reilly hammer gun; a 20 ga. William Evans and one I'm not sure of. These were handed down to him by his grandfather and father. He also gave us a 500 page typewritten manuscript written by various members of his family over 70 years, much of it about hunting in India...tigers, snipe...you name it. It is an incredible British Raj type journal and an amazing insight into the mores of the early 20th century. (Published years later as part of "Musings and Memories"). He usually used his H&H when we hunted. Genevieve in Haryana along an Irrigation Canal, 1990 - wonder why the General gave her the 20 gauge? General Palit was an utterly fascinating man and I was fortunate to see India at the tail end of the Raj - the "permit raj" - When India was still little changed from the British days. Welcome and Thanks Argo44! Looks like you have some fascinating stories in your memory banks! Keep them coming! The first line reads - starts off with Maharaj Pratap Singh Ji the rest is a little too indistinct for me (perhaps a younger pair of eyes... ) What an interesting start! Many thanks CK. Here is the gun. Can you make anything out on this label? If you click on it, it should take you to the original on JPGBOX. And thanks again. Corbett 99 has done some shooting with the Kolahpur family . Not sure if he is active here now. I lost touch with him (Sudhir/ Corbett99) a couple of years ago ....after we hunted the Maneating leopard of Lansdowne. Vikram wrote: If you can read Sanskrit/Devanagari, please help our member in deciphering the text in this photo. Thank you. 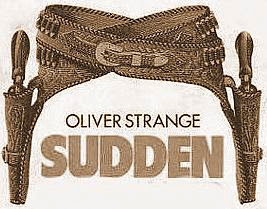 I am not very good at reading this script but will make an attempt. The top line starts with Maharaj Pratap Singh Ji. These words are very clear. Then the handwriting looks like has been written in a too fast manner. I am just guessing what they possibly seem to be. After Maharaj Pratap Singh Ji, there appear to be two words. First one sounds like dhai, the second one sounds like sojan. The first word on second line looks like carvan. Rest of the second line appears illegible to me. The third line begins with numerical 200, then a closing bracket. After that what is written appears illegible to me. In the lower right hand corner, on the lower portion of circular partially torn white paper, affixed on the label, numericals 450 are written. Both the numbers 200 and 450 are pretty much clear and legible. The script reads .. Maharaj Pratap Singh ji Solarkar or Sarkar Palamau. Vaishak..(i.e April/May) Sudi 12 means 12 of April/ May..Sanwat 1937 means Hindu calendar Vikrami Sanwat 1936. that is 137 years old. The script reads .. Maharaj Pratap Singh ji Solarkar or Sarkar Palamau. Vaishak..(i.e April/May) Sudi 12 means 12 of April/ May vikrami sanwat 1937. The gun is hence 137 years old. The script reads .. Maharaj Pratap Singh ji Solarkar or Sarkar Palamau. Vaishak..(i.e April/May) Sudi 12 means 12 of April/ May..Sanwat 1937 means Hindu calendar Vikrami Sanwat 1936. that is 137 years old. 200 Silvers rupees paid to the seller along with some presentation.